United Feature Syndicate, which distributes the venerable series, claims it's one of the ten longest-running comics extant. What's more, tho syndicate materials don't mention the fact, since not a word has ever been spoken in the strip since it began, it's quite likely the longest-running pantomime in history. 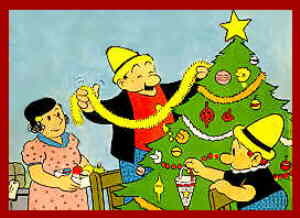 The strip started in 1937, distributed by Copenhagen's Presse-Illustrations-Bureau. It was created by Henning Dahl Mikkelsen, who had worked in animation before becoming a newspaper cartoonist. Lacking language barriers, it quickly became a hit all over Europe, and made "Mik" (as Mikkelsen called himself in signing Ferd'nand) an international celebrity. Mik brought his strip to America on November 10, 1947, when United Feature (whose other comics include Gordo, The Captain & the Kids and Li'l Abner) picked it up. The cartoonist himself moved to California shortly afterward. But Ferd'nand never quite became an American strip — it always seemed to have an Old World flavor to it, and has remained very popular throughout Europe. The character Ferd'nand — at least, we assume his name is that of the strip — is a regular guy, chubby, good-natured, middle-class. His wife and son, whose names we don't know because nobody is ever addressed by name, or in any other way, are the same. Ferd is never seen without a black jacket and an odd conical hat (like Chico Marx's, but taller); and Ferd Jr. wears a duplicate of the hat. The hats give the male members of the family a unique look, identified the world over with that series. Mrs. Ferd, however, looks pretty ordinary. United Feature claims Mik continued to draw the strip until his death in 1982. However, it's widely known that he used ghosts at least as early as the 1950s. Frank Thomas (no relation to Disney animator Frank Thomas), whose comic book credits include a minor Dell Comics character called The Owl and an even more minor Centaur Publications character called The Eye, handled it from 1955 until the mid-1960s. Al Plastino, whose varied credits include Superman, Nancy and Terry & the Pirates, ghosted it from 1968 until 1989, signing it "Al + Mik" after Mik's death. Garé Barks, wife of Uncle Scrooge creator Carl Barks, contributed gags. The current artist is Henrik Rehr, author of more than a dozen graphic novels published in Europe. Ferd'nand has never been a cross-media phenomenon. Mik was involved with a few animated cartoons about the character in Europe, but they're very hard to find today; and there have been no Little Golden Books, Big Little Books, feature-length films, etc. But on the comics page, it has been quietly — in fact, silently — amusing millions of readers daily, for decades. And from all indications, it could very well continue doing so for decades to come. Text ©2001-07 Donald D. Markstein. Art © United Feature Syndicate.